A monkey breeder has been cleared of causing unnecessary suffering to a capuchin baby and mother that he had separated for sale. 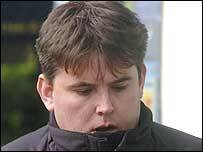 Jason Allen, of West Cross, Swansea, criticised the RSPCA for the sting operation which led to his arrest. In his verdict, the district judge said it was not illegal to keep or sell capuchins or separate mother and baby. Mr Allen, 33, said he had read up on his subject and understood separation would only cause temporary upset. He was lured to the Leigh Delamere services on the M4 in Wiltshire, after an RSPCA officer had seen an advert in a trade magazine offering the infant capuchin for sale at £4,000. The officer set up a deal with Mr Allen on the phone and arranged the meeting when it looked as though the monkey would be sold to a rival buyer. When he arrived, two policemen seized the baby monkey and arrested Mr Allen. The infant was taken by animal experts to Monkey World in Dorset, where it was reunited with its parents. During a three-day trial in Swansea, Mr Allen claimed from the outset that rejection of the infant by the mother was already taking place when he had decided to sell. After the verdict he said the RSPCA's actions amounted to entrapment. The arguments centred around expert evidence which claimed or denied that the separation could cause psychological injury. Dr Alison Chromin, scientific director of Monkey World, argued that the animals had both suffered mental injury, which potentially can cause physical symptoms, due to the separation. But vet Douglas Wise claimed studies had shown that infant capuchins removed from their mother at day one went on to grow and weigh the same as capuchins left with their mothers. "So I would suggest that they were in no way distressed nor did they suffer," Mr Wise told the court. He also suggested that a mother, whose infant was taken away in her absence, may not have a memory that she had had a baby within the day that it happened. Giving evidence himself Mr Allen said he believed that the earlier separation took place, the easier it was for both parties. He had also checked with the "buyer" that he had a dangerous and wild animals' licence and already kept capuchins. Reaching his verdict, District Judge Richard Williams said he was satisfied that the case to prove suffering had been made but that he was not convinced it was unnecessary. What Mr Allen had done happened in pet shops with other animals all the time and causing stress was an inevitable outcome of separation, he told the court. 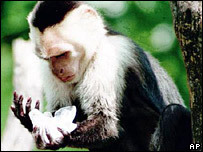 "If it is lawful to sell a capuchin monkey it must be lawful, at some point, to separate it from its family." Speaking after the verdict, Dr Chromin said if it was legal to cause suffering then the law should be changed, adding: "A primate is not a dog or a chicken or a duck, it is a social animal which lives for 40 years."